Where Is My Market Going? 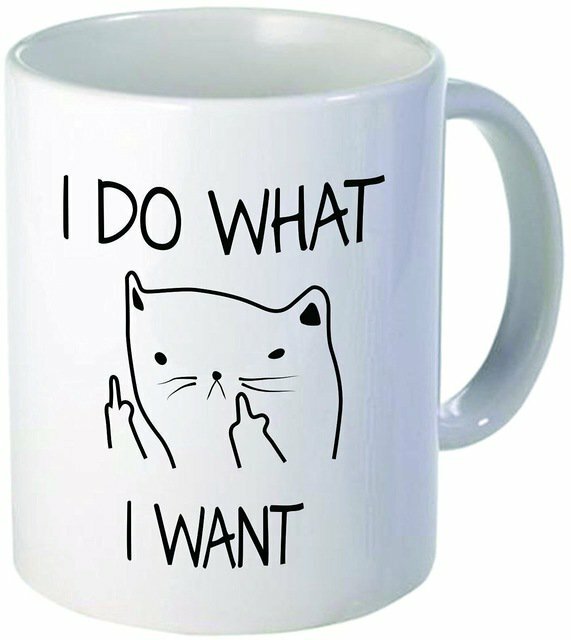 Although it is impossible to tell precisely how many visitors a site is getting without having access to complete logs, and similarly difficult to tell how one site stacks up against another (especially when some site masters don’t know how to differentiate image hits from page hits, etc. ), there are third party traffic tracking tools that provide one methodology of roughly benchmarking one site against another (although the accuracy may be questioned). One such site is Alexa, and as noted by Jason Busch over on Spend Matters in November of 2007, Sourcing Innovation, the only other independent blog in the sourcing / procurement / supply & spend management space that publishes on a daily basis, was not only the 7th most visited publisher of original content in the space, but the fastest growing content publisher in the space! With a three month change of 672,310 in the rankings, Sourcing Innovation’s growth rate was almost triple that of Spend Matters and essentially five times that of Supply Chain Digest, which was growing slowly while all of the other publications were essentially standing still. Not bad for an upstart blog that had been publishing for slightly less than a year and a half at the time! Another such site, which I find to be much more reliable and consistent in rankings from month to month, is QuantCast. Between December 1, 2007 and March 8, 2008, Sourcing Innovation‘s ranking steadily increased from 5,530,305 to 434,201, making it, according to Quantcast, the fourth most trafficked publication in the space, preceded only by ISM’s Inside Supply Management, Purchasing Magazine, and Supply Chain Digest. 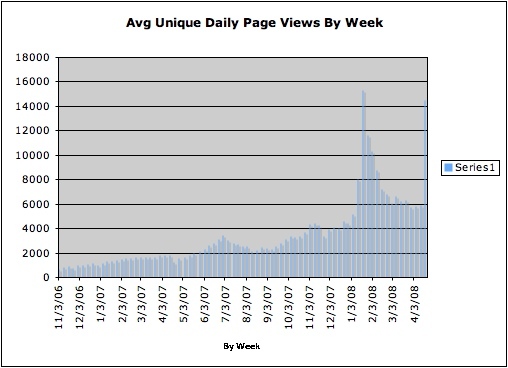 In addition, Sourcing Innovation is now peaking at an average of 15,000 unique page views a day! With the average visitor viewing an average of 1.5 pages per visit, it’s easy to see that peak days on Sourcing Innovation now attract almost 10,000 unique visitors, with average days generating over 8,000-plus page views and 5,000-plus unique visitors. The following graph, complied using the built-in analytics package that accompanies the blog software, demonstrates how Sourcing Innovation hit this peak for the weeks ending January 19th and April 19th and that, once a peak is hit, daily SI traffic will eventually rise to that level! Moreover, this traffic is starting to become truly global in scope! Although the US still accounts for the majority of traffic at roughly 57%, we now have Canada representing 7%, the UK and India coming in at 6% each, China accounting for 3%, Germany and Australia with their share at 2%, and France and the Netherlands accounting for over 1% – and over 150 countries are represented in the last 15%! However, the best measurement of this blog’s success is the bandwidth consumption rate, which is the most carefully tracked metric by any ISP. 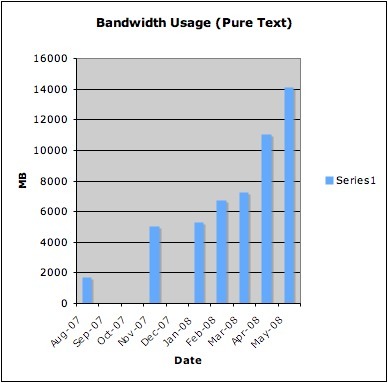 This blog is now serving up over 14 GigaBytes of pure text a month! (All images are hosted on separate sub-domains or web-sites with their own bandwidth allocations.) To put this in perspective, this is roughly equivalent to serving up the *entire* text of the Encyclopedia Britannica over fifty two (52) times each month! This entry was posted in About us, Advertisement, Miscellaneous on November 12, 2007 by thedoctor.